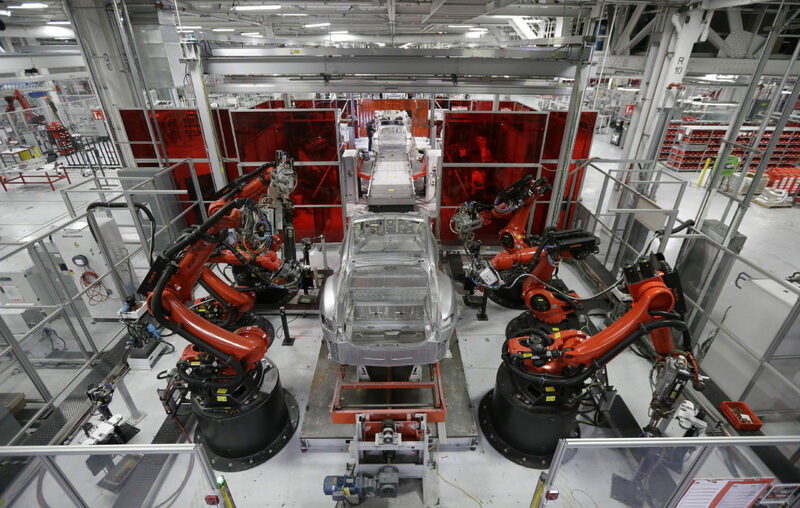 Robots work on Model S cars in Tesla’s factory in Fremont, Calif., in 2015. Tesla is among thousands of U.S. companies that once had to submit employee injury records to the federal government. But OSHA suspended that requirement, prompting a lawsuit last week by three interest groups. The nation’s federal workplace safety regulator violated the law when it suspended a requirement that companies submit their employee injury logs, according to a new lawsuit by three advocacy groups. In their suit, filed last week in the U.S. District Court for the District of Columbia, the organizations contend the federal Occupational Safety and Health Administration failed to follow proper procedures by extending the deadline without allowing the public to weigh in, and then announcing it would not accept the data from the roughly 450,000 companies subject to the rule. The suit was filed by Public Citizen, the American Public Health Association and the Council of State and Territorial Epidemiologists. OSHA on Friday announced that it intends to roll back parts of the Obama-era rule, with the new rule requiring companies to submit summary data to the agency, but not more detailed information. The organizations asked the court to order OSHA to collect and publish the electronic data. The requirements were intended to encourage employers to improve safety and help OSHA investigators prioritize investigations. Public Citizen and other organizations hoped to analyze the data to identify trends in workplace safety. But some industry groups assailed the rule, saying OSHA had overstepped its authority. In separate lawsuits filed earlier this year, Public Citizen and The Center for Investigative Reporting asked the court to order OSHA to provide the data after their Freedom of Information requests for the injury and illness data were denied. Both cases are pending. From 1995 to 2011, OSHA collected data on injury rates for tens of thousands of employers. The data is available on the agency’s website. The program ended in anticipation of launching the new reporting requirements, which were finalized in 2016.